The grandson of the legendary explorer has a new plan. Fabien Cousteau believes that you, me, any of us, can live together underwater. With technology that either already exists or is in development, humans could build self-sustaining ocean habitats, analogs to the colonies we envision having when we first set foot on Mars. The advent of underwater cities is a vision Cousteau inherited from his grandfather Jacques Cousteau, the celebrated French explorer who popularized much of modern ocean conservation. Once, in 1963, he remained in an underwater habitat called Conshelf II for a month. Fabien’s mission appears predicated on the continuation of his grandfather’s legacy, but his own body of work stands on its own. 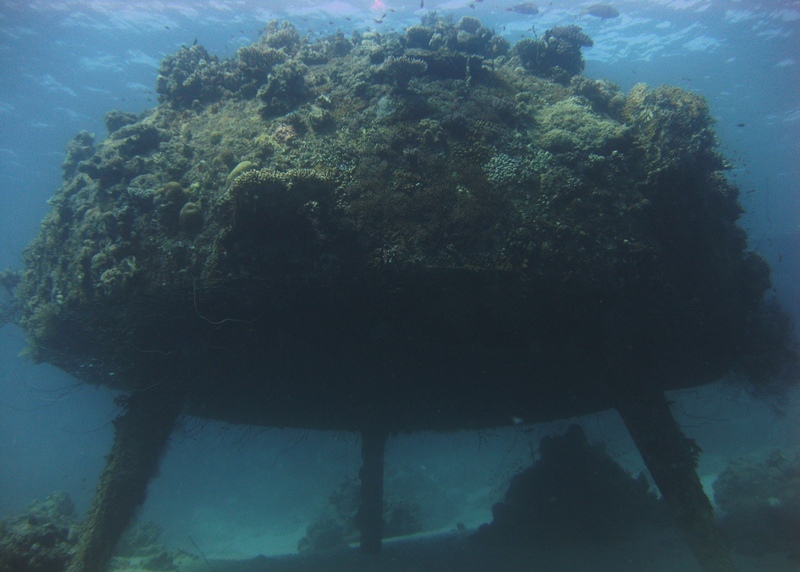 In June 2014, Cousteau spent 31 days underwater in a laboratory in the Florida Keys, a simultaneous tribute to and surpassing of the 30-day record his grandfather had set on Conshelf II, which has long since been taken back by the sea. The scientific and filmmaking expedition, called Mission 31, was streamed on the internet. Previous conceptions of underwater habitats were purpose-built, dedicated to a single utility. If we consider the ideas introduced by Jacques Cousteau to be the first generation of blueprints for underwater cities, his grandson’s would be the second. He envisions these habitats as being multi-functional, outfitted for study of marine biology, biosphere experimentation, prototype testing, even biochemical research on cures for disease. They’d initially still need what can be thought of as an umbilical for air supply and energy. With enough funding, we could go cordless, meaning an Atlantis-like environment of complete self-sufficiency. Where Would You Build an Underwater Colony? Like the Conshelf II, located in the Red Sea, a new underwater habitat might be built on a continental shelf. Every continent has one — the seabed extending through shallow water from land to the open ocean, legally demarcated at 200 nautical miles from the shore. Given no governmental or financial restrictions — a carte blanche, says Cousteau — he’d like to see early habitats constructed along the tropical belt (the equatorial region between the tropics of Capricorn and Cancer) as well as the polar caps. The latter make for a bold but extremely compelling prospect, subject as they are to a heightened state of flux due to climate change. Cousteau says the technology exists to withstand that. Some of these habitats could conceivably be constructed in the span of a single presidential term; what’s missing is the money. Mission 31, which took place during the summer, had actually been initially slated for the previous November, on the 50th anniversary of his grandfather’s original expedition — it was delayed by the government shutdown, which interrupted their permitting process. The crew was eventually able to proceed because the mission didn’t rely on government funding, but was privately backed by sponsors. Things have not improved. Germany is increasingly interested in ocean thermal energy conversion (OTEC), as is South Korea. The five-year economic plan the Chinese government released in 2016 included a behemoth underwater laboratory of unknown purpose — a military base, maybe, or a research station, or a prototype for an ocean colony of their own. The pocketable factoid that we know less about the bottom of the ocean than the surface of the moon is superficial in a bumper sticker-ish kind of way, but it does unintentionally highlight what the two biomes have in common. A lot of the systems and infrastructure we need to build underwater cities already exist in the field of space travel. Astronauts train for missions underwater; hospitals use hyperbaric chambers to accelerate the healing process after surgery; scientists use the deep ocean as a proxy for the kind of extreme environments we’d encounter out in space. We’d produce much of our own food via aquaponics and hydroponics — both areas of study already being pursued by NASA, as is algae farming. Underwater cities would need the capacity to treat most medical emergencies without returning to the surface, meaning that other NASA projects like the quest to grow human tissue in space are also what we’d be researching down below in order to achieve total self-sufficiency. That includes generating oxygen. The remains of Cousteau's Submarine Garage from Conshelf II, photographed in 2012. If you momentarily set aside the issue of scalability, breathing underwater is actually pretty straightforward. To sustain a small habitat, say for a family, there are a number of technologies that can extract oxygen from the water column. Alternatively one could bring down a three- or six-month supply from the surface. In order to supply an entire population, oxygen needs to be a renewable and entirely self-sufficient resource. The matter is understandably also of some concern for aspiring space colonists, which is why NASA has already done extensive work in water electrolysis and C02 scrubbing. The same principles apply underwater. Cousteau says if it weren’t for the issue of funding, we could begin installing habitats at a dozen locations immediately — “cabins at the frontier,” as he terms them, a phrase that strongly recalls Sir Richard Branson’s vision for commercial space tourism under Virgin Galactic. When astronomers canvas for potentially habitable worlds — either for signs of alien life or for a prospective Earth 2.0 — they look for a capacity for liquid water. This is why in addition to Mars, the most promising candidates are ocean worlds like Europa and Enceladus. The rise of the private spaceflight industry has already found such people. A whole lot of experts believe we will need to colonize Mars if we, as a human race, are to survive climate change. Stephen Hawking originally guessed humanity had 10,000 years left on Earth, a number he’s since amended to 1,000, and then last week to just 100. Elon Musk would like you to sell your house and invest in a one-way ticket off the planet sometime between now and doomsday. The near-universally held assumption about early off-world colonies is that humans who go to Mars will — assuming they make it — die there. The ensuing jostling of humans eager to do so seems to indicate that the idea of leaving Earth forever is no barrier. Stephen Hawking himself has joyfully accepted an invitation from Richard Branson to fly through space aboard the inaugural flight of the VSS Unity, which is basically an expensive glass-bottomed boat but for space, because he believes its push for space tourism is a vital step in getting us off this overheating rock for good. People engage in various levels of bullshitting about who those couple hundred or thousand people would be, but the numbers speak for themselves. Musk has cited $200,000 as a plausible cost for a civilian ticket to Mars, a bargain compared to Branson’s $250,000 for a 2.5-hour suborbital tourist flight, which doesn’t even buy you the chance to die in space when the apocalypse comes. Underwater cities won’t save us from climate change in the sense that everyone just moves down into the sea. But they would let us study its mechanisms at a rate exponentially more efficient than we’re capable of living on land. Divers need to budget time for their lungs to adjust to the increased pressure of the ocean and can normally only dive for around an hour at a time — the deeper you go, the shorter the period you can stay under. But the divers on Mission 31, who required no decompression, were able to dive up to nine, even 12 hours in a single day. The data they gathered reflected that. Cousteau has been SCUBA diving since he was four. His talking points hit all the various bits of jargon we expect from “brand ambassadors” and “thinkfluencers” — exploring, dreaming, the requisite denouncing of the word ‘impossible” — but he elevates them with the specifics and sincerity you need for them not to feel empty, especially in-person. His work in ocean conservation and education spans everything from climate change to plastic pollution to embedding himself with great white sharks by piloting a submarine shaped like one. He might draw a few comparisons to Musk if he were less beset by social conscience. Assuming we survive climate change long enough to escape it, we will have the ability to create cities in space at some point. Assuming we want to give ourselves the best chance of fighting it, we have the ability to create cities underwater right now.